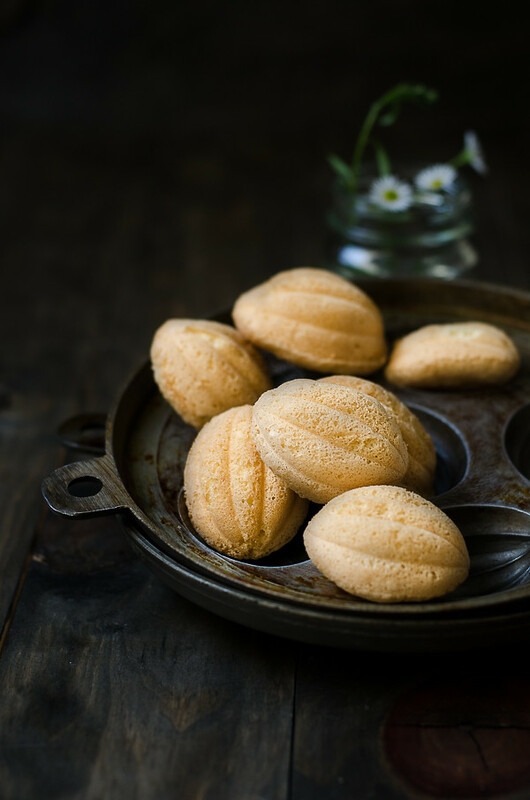 Kuih Bahulu or bite-size sponge cakes are familiar sight adorning tables during festives season, be it Eid-ul-Fitr or Chinese New Year. It was pure hardwork/laborious task to bake these little cakes during those flower power era (60's - 70's). Grandmothers and mothers in those eras, just 'cook' these sponge cakes using the same mould as I did in the video / photo, no oven but charcoal heat instead. This task may require 2 or more family members to be involved. One family member would 'whisked' eggs till pale using only a big 'spring like' whisk. While whisking egg to reach its fluffiness, or until her shoulder ache and dropped off (just kidding ;P), second person would start the charcoal fire going...huffing and puffing away. 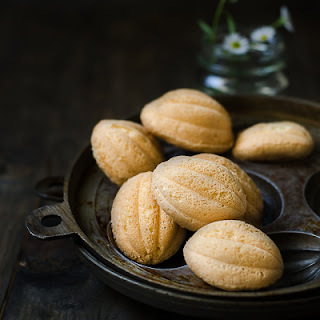 Kuih Bahulu is one of my all time favourites, I guess I am an old soul, I love traditional cookies, and to witness how kuih bahulu were cooked those days, makes me appreciate these bites even more. If you live in Perth, you can find this mould at a shop in Canning Vale, next to the big Asian grocer (sorry...can't recall its name). 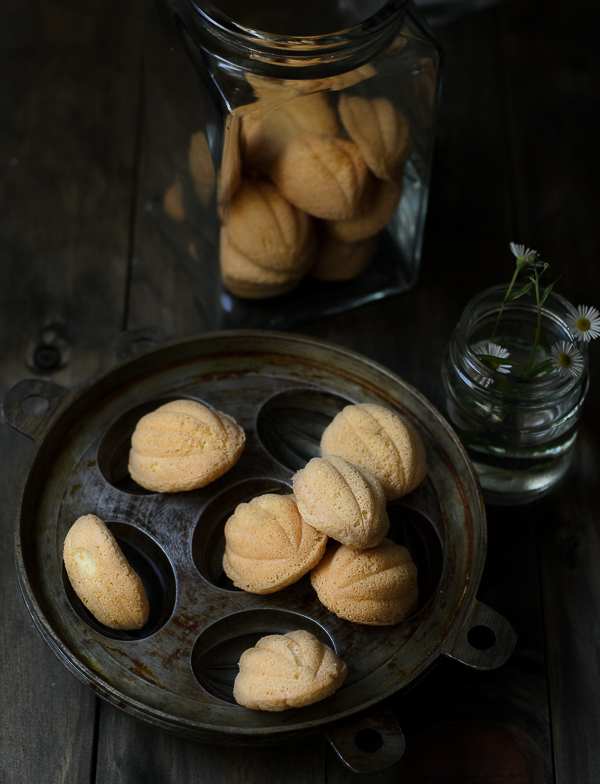 Put in the moulds if you are using the traditional Kuih Bahulu moulds, otherwise the madeleines pan is ok too, but watch for the doneness. In a stand mixer, whisk egg whites with caster sugar till light and stiff (meringue-like stiffness). Add egg yolk one at a time. Add flour in four batches, gently mix flour in each addition. Bake at 220C for 10-12minutes or until golden in colour. Use skewer to remove cakes from mould. Thank you, yang, oghang Aberdeen nak order dak ;P? Wah syiokk kalau dapat cicah dengan ayaq kopi hangat. Hihi, may i know how many can your recipe yield? Thank you. I have seen kuih bahulu recipes all using whole eggs to beat with dugar. Yours beated the whites 1st.Is there any reason? Beat the egg white first to create air within so the bahulu will not be dense.